Though acceptance and mindfulness interventions have proven enormously effective for adults with stress, anxiety, depression, and other mental health issues, they have not been fully documented for use with children and adolescents. And yet they are a natural fit for children's therapy-the focus on acceptance and mindfulness builds children's psychological flexibility, and the values component of these methods helps young people learn to set goals and take action to achieve them. 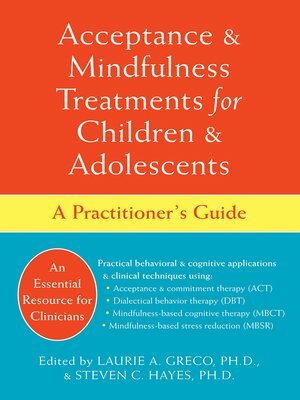 The chapters in Acceptance and Mindfulness Treatments for Children and Adolescents show how to modify third-wave behavioral and cognitive therapy methods for the treatment of children and adolescents. This book also considers the early evidence for the adaptability and effectiveness of these methods. Edited by two luminaries in the field of third-wave behavior therapy, these essays will be invaluable in helping young patients reap the benefits of acceptance and mindfulness approaches such as acceptance and commitment therapy (ACT), dialectical behavior therapy (DBT), mindfulness-based cognitive therapy (MBCT), and mindfulness-based stress reduction (MBSR).